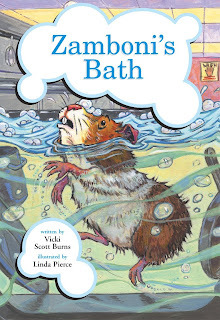 Zamboni's Bath, published in March 2007, is the first book in the series. In this book, Billy unknowingly carries his guinea pig, Zamboni, to school in his backpack. Zamboni's escape and the commotion he causes are humorously described as he scurries his way through the school cafeteria. Click here to purchase Zamboni's Bath from Kaeden Books or visit www.kaeden.com. Zamboni's Goal is in the second book in the Zamboni series. It is currently in the publication process and is expected to be released this year. In this book, Zamboni stows away in Billy's hockey bag and escapes into the hockey rink during a game. Zamboni inadvertently ends up on a hockey puck as it scores a goal. A publication date will be announced soon. 1) It transitions children from picture books to chapter books. 2) Part of the 2nd Grade Social Studies Curriculum focuses on community/neighborhood. This focus is reflected in the setting of each book in the Zamboni series, with correlating vocabulary words. This widens the students' text-to-self and text-to-world schema development. It also provides an avenue for intracurricular learning. 3) Each book begins and ends in the same manner, and each book chronicles Zamboni's escape from his cage and his ensuing adventure. This helps students deepen their text-to-text schema development, make story predictions, and identify an author's stylistic voice. 4) As a result of the schema connections described above, students can use the Zamboni series as a model for writing their own Zamboni stories in a locale specific to their community or neighborhood, thus engaging the students in intracurricular learning. 5) In addition to its literary purposes, the Zamboni series also portrays the emotional connection felt between children and their pets. 6) Finally, the Zamboni series provides a humorous and delightful reading experience. Step forward and enjoy Zamboni's adventures! All content (c) Vicki Scott Burns.